From measuring teens’ internet usage to finding out what devices they own, Pew Research Center has been examining the digital lives of teenagers for over a decade. Our latest report focuses on how teens, who often live tech-saturated lives, develop and sustain friendships in the digital age, including where they meet, communicate and spend time with friends. 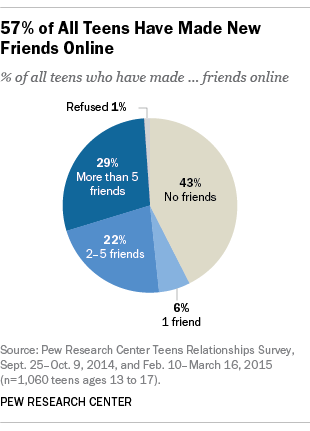 1More than half of teens have made at least one new friend online. Fully 57% of teenagers have met a new friend over the internet, with nearly three-in-ten teens (29%) saying they have made more than five friends this way. But most of these relationships remain online, with a majority (77%) of all teenagers saying they have never met an online friend in person. 2Social media sites are popular places for teens to make friends online: About two-thirds (64%) of teens who have met a friend online say they have met new friends via a social networking site. Additionally, a majority of teens say social media platforms have made them feel more connected to their friends’ lives and feelings. Roughly eight-in-ten social-media-using teens (83%) say that sites like Facebook or Instagram make them feel more connected to what is happening in their friends’ lives, while 70% say these social platforms make them feel more in tune with their friends’ feelings. 3For some teens, there are downsides to social media. Fully 68% of social-media-using teens say they have experienced drama among friends on the platform. More than half (53%) of teen social media users have seen postings on social media about something to which they weren’t invited, while some teens feel pressure to post only content that makes them look good (40%) or that will be popular (39%). 4Teens use a number of platforms and devices to keep in touch with friends, but text messaging is used on a daily basis much more than others. 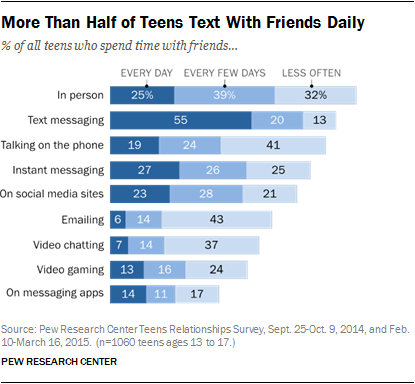 Roughly nine-in-ten teens (88%) spend time with their friends via text messaging at least occasionally, and 55% do so every day. Phone calling, instant messaging and social media are also popular ways for teens to spend time with friends, but in comparison with texting, they are used far less for daily interactions. Few teens keep in touch with friends on a daily basis by email or video chatting. 5Roughly one-in-four teens have fought with a friend because of something that first happened online or because of a text message. While a majority of teens have not fought with a friend over something that initially occurred online, 26% of teens have experienced this type of digitally facilitated conflict. Teen girls (32%) are more likely than their male counterparts (20%) to say they have had this type of conflict, while whites are more likely than blacks to have fought with a friend because of something that happened online. 6Video games play an important role in the development and maintenance of friendships – especially for teen boys. Roughly three-quarters (78%) of online gaming teens say they feel more connected to existing friends with whom they play games. For boys, that share is even higher, with 84% saying networked games make them feel more connected to friends when they play, compared with 62% of girls. Overall, boys are much more likely than girls to make new friends while playing games online (57% vs 13%). Boys also spend more time playing video games with friends: 16% of boys play videos games in person with friends every day or almost every day, compared with just 5% of girls.